We had an absolutely amazing day for our BBQ. We all crossed our fingers that it wouldn't rain and boy, it must've worked because it was a scorcher of a day. But we donned are floppy sun hats and sunscreen and headed out to Robson Park. We had an excellent turnout and we must say that the kiddie pool was a total hit with the pitties. 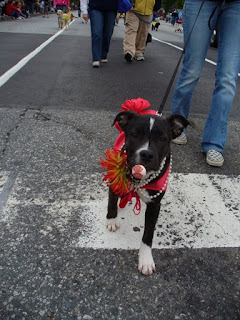 Tons of games, events, Marlo even slipped the judge the tongue in the kissing contest. 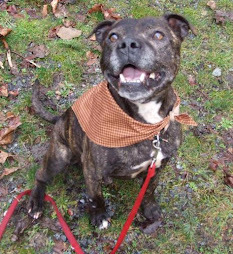 Oh Marlo...you brindle beauty you. 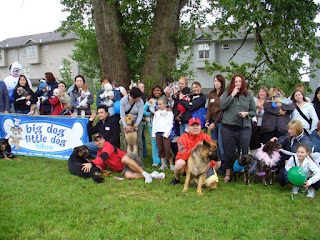 A big thanks to all those of both the human and the canine variety that came out and showed off that pitty pride. 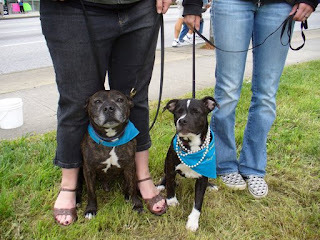 Everyone was very well-behaved and showing off just how wonderful these dogs truly are. A special thanks go out to our BBQ masters- Mike, Barry, and Mike; Wendy the behind the scene organized queen; Michelle and Sam; Sarah--for rocking the obstacle course and the doggy backpacks; Lex--for being an extra set of hands if we needed it; and if we've forgotten anyone we're sorry--the sun fried our brains a little bit! Until our BBQ. It will be a great kick-off to your summer festivities and we hope to see you all there! 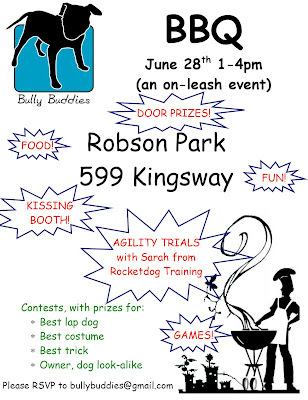 Ella, Perogy, Rock, Crash, Fin, Old Man Arthur, Cici and lots more of our dogs will be there. Lisa and Muay were at it again! the nationals in New Brunswick. Congratulations! Proud mom and proud Muay showing off their ribbon at the end of the competition. There are only two weeks left in the current session of Behaviour for Bullies but man, our dogs are doing so great. Their parents must be doing lots of practising with them during the week. Kalee and Boodha getting ready for class Tulip from the Vancouver Animal Shelter dropped by. She's a beautiful girl with brains too! Sarah talking about the importance of having a well-mannered dog at the end of the leash. Somebody's camera shy! I love Jada and I finally got the chance to see her get silly on Saturday. Although in true lady like fashion, she regained her composure very quickly. Smarty-pants Cheyenne showing off how good her heel is. Dexter did awesome at our last class. Working hard... or hardly working? Look at the smile on this face. Milo is so cute. Oh Ella. Ever hopeful. You make us laugh. I Love Oscar. Oscar has temporarily been crashing at my house until he could find a more permanent foster spot (thank-you Erin!) as my house is pretty full already. He is one of the best foster dogs I have ever had. Mellow, confident, and easy-going. This is him on his first night with me. My nephew Beck was spending the night and the two of them were joined at the hip. Oscar wouldn't leave his side and even went down the slide with him at the park! Seriously, Oscar will fit himself in just about anywhere as long as he's got a comfy spot on the bed and some belly rubs to be had. Have I mentioned that I totally love this dog? Our annual BBQ is coming up quick so make sure to mark it on your calendars. We'll see you there! But it was lots of fun anyways! 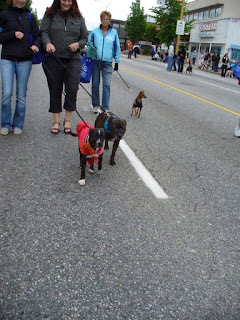 For the third year in a row, Big Dog Little Dog Bakery has invited us to partake in their annual parade. 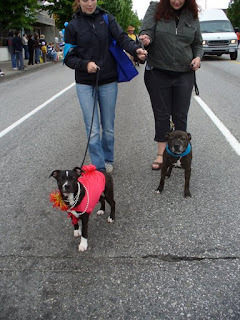 This year, adoptable cutey pie Sprout and alumni Arthur went off to show off their Pit Bull Spirit. Sprout looking ever so cute wondering where they're going in such a get up! 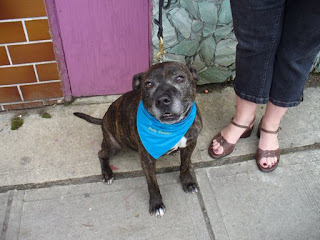 Arthur came too and wanted to model off our new bandanas. They look great Wendy! Work it Arthur, work it. Sprout and Michelle: "Let's get this party started!" Arthur and Sprout showing the brindle spirit. Look at how cute these two are. Sprout giving out free cuddles to all who want them. Whew! After the parade, Sprout was tuckered. After all, it's hard work to look that good all the time. All in all, it was a fantastic day. Hat's off to Big Dog Little Dog Bakery for inviting us . 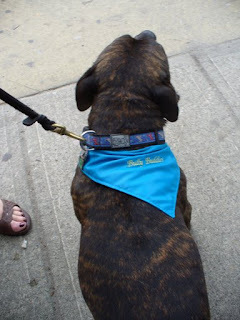 A big thanks to Wendy, Michelle, and Cheryl for being the human ambassadors for Bully Buddies and to Sprout and Arthur for being the amazing canine ambassadors that they were born to be. Wow! This is amazing news. Let's hope this has a ripple effect on other countries to actually look at the facts when considering their dangerous dog policies. 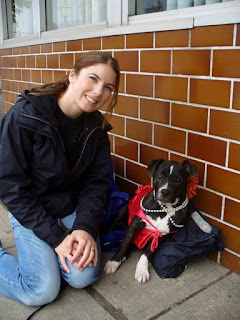 AMSTERDAM, Netherlands - The Dutch government says it will lift a long-standing ban on pit bulls because it did not lead to any decrease in bite incidents. Agriculture Minister Gerda Verburg has informed parliament of the decision, which follows the advice of a commission of experts appointed to review the policy. Instead, the country will focus on enforcing local leashing laws and owner education programs. Spokesman Koen Geelink said Monday the ministry hopes to have a new policy in place by year-end in which dogs that have displayed aggression will be tested by an expert. 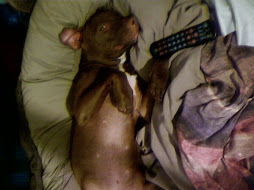 The country banned the breeding and possession of pit bulls in 1993, after three children were killed by the dogs. Just wanted to give you all a quick update on Ella. She just came out of surgery and although she did make it through the surgery, they realized that the tumor was much more invasive than we originally thought and they were unable to operate on it. Although we are very sad by the long-term prognosis, we are happy that she made it through the surgery (it was a risky procedure!). 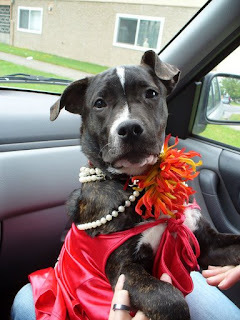 And the good news is that Miss Ella will be coming home tonight to her VERY OWN HOME!! 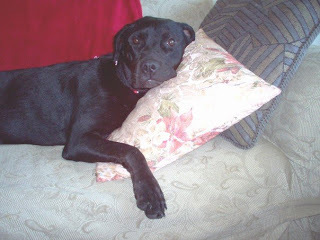 Sam is officially adopting her and she will spend her days being spoiled rotten and loved very much. Kaida was one of Merry's pups from the litter we adopted out in January. We knew this little girl as Ivy, the tiny spitfire of the group. 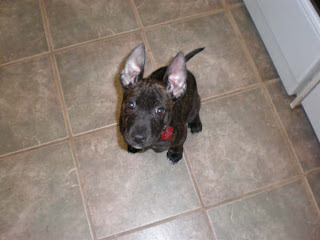 Her new parents have done a fabulous job at ensuring she grows up to be a stellar ambassador for the breed. We are doing great! Kaida (Ivy) is doing really well. We hope all her siblings are doing well. We were very curious as to how big all her siblings where now. Kaida is around 30-35 pounds now and is a full of energy! 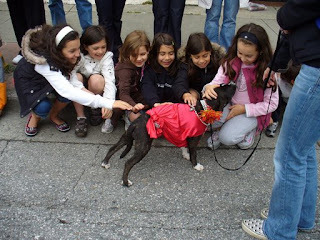 We went to the Western Canada American Pit Bull Terrier Club fun show on May 24th. 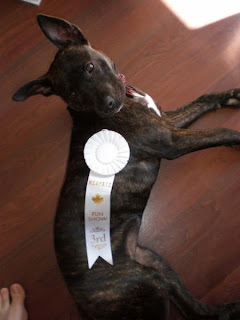 Kaida entered into the best brindle, best couch potato, and 4-6 month female puppy confirmation. We are proud that they announced her 3rd place in the 4-6 month old confirmation. We included a picture with her ribbon. 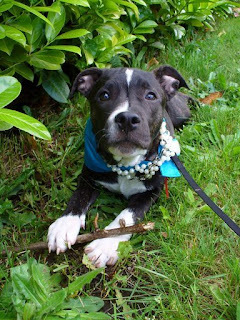 Kaida loves to play with other dogs and kids. 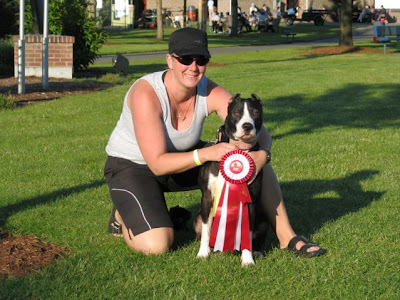 Her favourite duo is a 10 month old dalmation, Pongo, and his 4.5 year old owner, Kieran. It's pretty wild when Pongo and Kaida play as they rip around the house and outside then back inside then out again! It's kinda funny though, as soon as you think she is getting tired out, BANG!! she starts running circle laps like her tail is on fire! Absolutly hilarious to watch.